Our Little Acre: Ding Dong, the Bedbug's Dead! It was bound to happen sooner or later. With all the traveling that my mother and I do, we'd remarked that it was pretty amazing that we'd never encountered bedbugs. After all, they're at epidemic proportions in the US, with even the nicest hotels not escaping these disgusting parasites. But of course, we didn't really think it would happen to us. No one ever does. I learned about bedbugs in my Master Gardener classes two years ago. I'll admit, I didn't pay really close attention to the details about them, because I never thought I'd need to know details. Little did I know that less than two years later, I would. When Mom and I attended the Northwest Flower and Garden Show in Seattle in February, we stayed near the Convention Center, in a highly-rated four-star hotel. I chose that hotel because they'd had good ratings from people who'd stayed there and the cost was less than the other large chain hotel in the area. When we arrived, we found our accommodations to be lovely and clean. The third night of our stay, Mom got up to go to the bathroom around 3:30 a.m. and I got up to turn down the heat. She remarked that her leg was really itching now and did I think maybe there were bedbugs and could I please check? I walked over to the bed and no sooner did I get there when I saw a bug crawl across the sheet where my head had been laying just minutes before. I took a close look and don't you know - BEDBUG. I got a plastic container that I'd brought some earplugs in and I captured it. We got dressed and went down to the front desk and handed it to the desk clerk. "We've got a problem," I said, as I handed him the box. He took a look at it, and obviously knew what it was. He calmly said that he would put us in another room right away, but we'd have to leave our belongings in the original room so that we didn't take the chance of spreading the bugs to our new room. We took only what we needed for the next day and after inspecting the mattress in our new digs, we quickly went back to sleep. NOT! Neither of us could sleep at this point, so we discussed what might happen from this point on. I got online to see what the normal protocol was when encountering bedbugs in a hotel and in every instance I could find, full compensation for the stay was given to the hotel guest. After our return, the hotel manager informed us that they had not found any bedbugs in our room and since they had "no proof" that any were there (!!!! ), they would only offer one night's compensation. He said had they found proof of bedbugs, our entire stay would be comped. Well, several bites and a bedbug were all the proof we needed! We'd be contacting the hotel manager. To the hotel's credit, they explained that they had a pretty aggressive bedbug detection system, with dogs being brought in once a week to detect them. But of course they can arrive at any time in between. And since we'd not had any issues with bedbugs in our homes or anywhere else for that matter, we were certain it wasn't us that had brought them in. In the end, we did get our entire stay comped, and even though they treated our things, we took precautions after returning home. Our suitcases weren't brought into the house, but stayed in our garages. Bit by bit, I brought things back into the house, laundered them, and I used a blow dryer on my suitcase to kill any bedbugs that may have hitchhiked home. Extreme heat is the method of treatment. 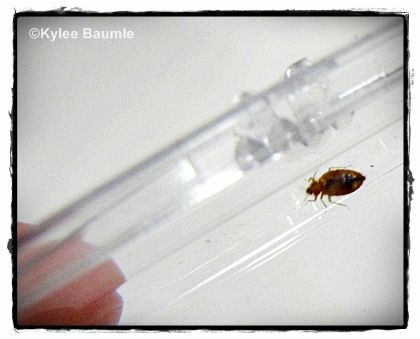 The bedbug came home with me too, in its plastic case, though the hotel manager wanted to keep it. He took photographs of it and so did I. Once back at our house, I left it atop the refrigerator in the garage and I checked on it weekly to see how long it would take it to die. My intent was to not bring anything from my suitcase back into the house until it was dead. Do you know how long a bedbug can live without food??? According to some sources, four to six months, maybe longer. I checked the bedbug periodically and finally, just this week, no movement was detected. The bedbug was finally most completely dead, 65 days after its capture. Check the Bedbug Registry before you go, to see if the hotel where you plan to stay has had a problem with bedbugs previously. Check the seams of mattresses for signs of bedbugs when you get to your room. Check behind the headboard, where they can remain undisturbed for longer periods of time. Place your suitcase on a chair (not an upholstered one!) or shelf or cabinet, off the floor, preferably metal, since they have a hard time climbing on metal. Bedbugs are most active between the hours of 3:00 and 5:00 a.m.
Bedbugs are more prominent in warm, humid climates, but they travel well. When you get home, put your clothes and other things in the dryer (set on high heat) before you wash them, to kill any bedbugs you may have brought home with you. Washing them won't kill them. Sleep tight! Don't let the bedbugs bite! We had problems once when we were traveling in Florida - what an itchy mess when you're traveling! How awful. I know it used to be a common problem many years ago but it is returning. I don't like that. Oh Kylee, I would not have been happy at all! Good you were so vigilant both at the hotel and once you got home. We are traveling tomorrow, so I clicked on your link right away! Our nephew and his wife had them in their apartment. Soon after the bedbugs were taken care of nephew and wife came to visit, we HOPED it was taken care of! That is a nightmare. Thanks for tips on checking... I would remain disturbed about that experience for a very long time. Thanks for the heads-up Kylee. What an awful experience. It seems that it is becoming all to common. Those rascals are awful. Poor Mom. How dare they question your evidence. Glad you got the room comped. It is a good warning to check the mattress before lying down. Oh my goodness, Kylee, how awful! I've read that bedbug infestation was on the rise, but I never think of this when I stay in a motel. I hope they stay away from Asheville! Thanks for the great information and tips--it's pretty scary to think how long these creatures can live without food. Susy ~ Thanks for the DE tip! That reminds me - I need to get some for the chicken coop! Gail ~ I don't like that either. I believe they used to be controlled with DDT, which of course was banned years ago, as it should be. Darla ~ We weren't either! LOL! Janet ~ We're certainly going to be more vigilant now, as a result of our experience! Safe travels! Ilona ~ It's not an experience we'll soon forget! Hi Kylee, What a terrible hotel experience! I cringe to think of it. Thanks for the tips about dealing with them. I would have thought that washing the clothes might have got rid of them. I never would have thought to use the dryer first. OMG ! Kylee .. I worry about that sort of thing when husband has his annual trip to Cuba .. I know all types of hotels are affected .. it is such a revolting thing to go through and wow on how they can survive so long without "food" !! Good for you holding your ground with compensation .. there shouldn't be an arguments about that at all ! PS .. Hope you never have to go through that again girl ! Target sells a small spray bottle that contains a premetherin mix that kills bedbugs. It is for travelers to spray on their luggage and bedding. I travel with it and respray my luggage every few months. Still... I'm paranoid. Hubby and I used to be frequent travelers but not so much anymore. And now with the bedbug epidemic we don't even have the desire to overnight getaways closer to home. Like you found out even the four star places can have them. I'm so sorry for your ordeal but glad to know the bug finally went legs up.